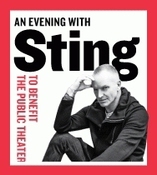 At The Public Theater in New York City (a unique historic venue for artists of all types), Sting has been performing his new CD titled The Last Ship, which will also appear on Broadway as a musical next year. The premise is based on the local shipbuilding industry in the town of Wallsend, England, where Sting lived as a boy. After arriving at The Public, I sat in the Levin Lounge upstairs with other patrons in order to wait until it was time to say, hello to Sting. (By the way, all of the proceeds from the tickets purchased for the event were given to support The Public Theater and its endeavors.) As I sat in the lounge, two lovely young women who represented the theater and were integral in coordinating the performances came over to speak to me. They were both magnificent at their jobs, making sure everyone was completely comfortable. They had been around Sting for many days as the rehearsals and shows were underway, and told me of their enjoyable encounters with him. The ladies appeared extremely genuine and their comments truly heartfelt, but I was determined to find out for myself what vibe I would get from Sting during our brief one-on-one, as well as, throughout the concert. To my excitement, we were promptly ushered into a small room an hour before the show. Artwork depicting scenes of the ships he once watched being built, created by one of his childhood friends, hung on the walls. Suddenly, Sting appeared in the room, clad in a worn t-shirt and jeans, work boots on his feet. No sense of pretension, whatsoever, smiling from ear-to-ear, as if the pleasure was all his! Charming and sporting an air of peaceful dignity, he looked decades younger than his chronological age, and was interested in each and every person. My only thought: "Wow. This guy has got it all figured out." As we were then shown to our seats, I noticed his wife, Trudie Styler (also looking 20 years younger than her apparent age and stunning in person), with their children in tow, walking in to see Sting's performance. The love and admiration that his family holds for him and his achievements is undeniable. As Sting took the stage with several other musicians and singers, he explained how this entire project began and how it became what it is today. He said he took himself "out of the way" in order to portray the harsh, yet passionate, day-to-day lives of the men who built the ships. The emotions and songs simply flowed through him. As a boy, the sheer behemoth scale of these ships was quite a sight to see. However, the work that these men did and the lives that they led were extremely hard. Sting knew from a very early age that his purpose in life would lead him on a very different path, and without a doubt, he was right. Even with the expression of this new music from the point of view of the struggling shipbuilders, the lyrics and delivery of them was animated, fun, and engaging. The audience really got a feel for this downtrodden, yet delightful and spirited group of people. In the intimate 260 seat Anspacher Theater inside The Public, all were stomping their feet and clapping their hands! I glanced back at Trudy, who was sitting on the edge of her seat, noticeable pride welling up inside of her. Before, during, and after the show, I observed the interaction between Sting and his fellow performers on stage. His own humility and graciousness and obvious respect for the talent of these individuals was blatant; their feelings toward him were more than mutual. I was in awe of the positive energy radiating off the stage. Sting has always appeared without pretense. That is readily apparent to all who have read Broken Music. Still, since most of us will never enjoy a one on one with him, this was nice to read. I am also jealous of anyone who has been able to attend the Public Theatre concerts. Not only are they enjoying the intimacy of this venue with Sting and his mates, but they have been treated to more than half a dozen songs from The Last Ship not available even on the deluxe release. Hopefully, they will be on a CD from next year's Broadway show. If a song as wonderful as Practical Arrangement could not make the cut for the stage, how great must What Say You Meg be?